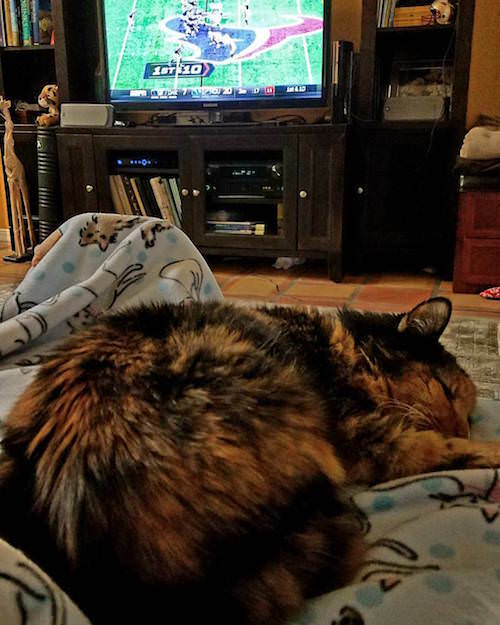 admin December 26, 2018 December 26, 2018 No Comments on UPDATE: Starving Senior Cat Who Refused To Give Up Just Found Her Forever Home! Just thought I’d let you know she made it here. She was so good in the car. She actually fell asleep at one point just like a kid in a moving car. I put her bed box in one room, her litter box in another and her cat tree on the back porch. Figured that way she will smell something familiar as she begins to roam. So far she is staying in my laundry room which is quite large. Hopefully by this evening she will venture out. At least there is food, water and litter box in there. I will be home the rest of today, tomorrow, Tuesday and Wednesday morning. This will give everyone a chance to get a little adjusted. 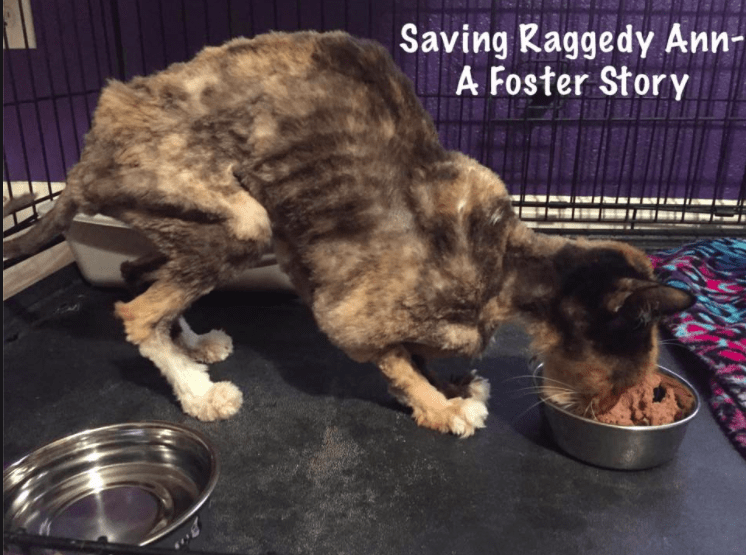 Thanks to everyone who shared Raggedy Ann’s story. Together, we can make a difference! Raggedy Ann (or Ann for short) was saved from a terrible hoarding situation. At the time of her seizure, there were 40 neglected cats and 2 dogs found cooped up inside a double-wide mobile home. Ann was nothing more than skin and bones, and as a senior kitty, youth was certainly not on her side. 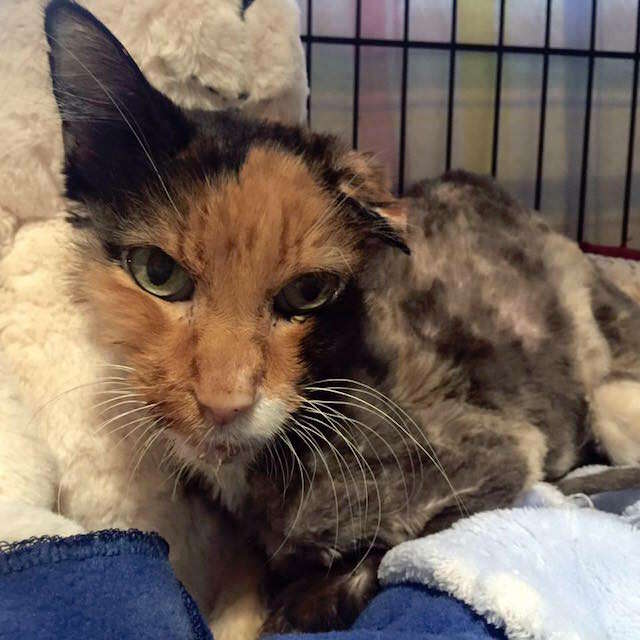 The emaciated kitty was taken to the Saving One Life rescue in Chandler, Arizona. At 14-years-old, she weighed a mere 3 pounds and 15 ounces, and they weren’t sure if she was going to make it. However, they refused to give up on her as long as she continued to fight for her life. 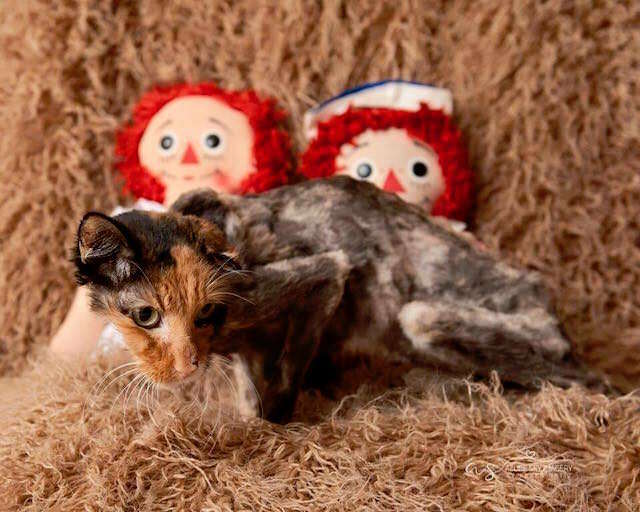 Raggedy Ann had her matted coat shaved off. 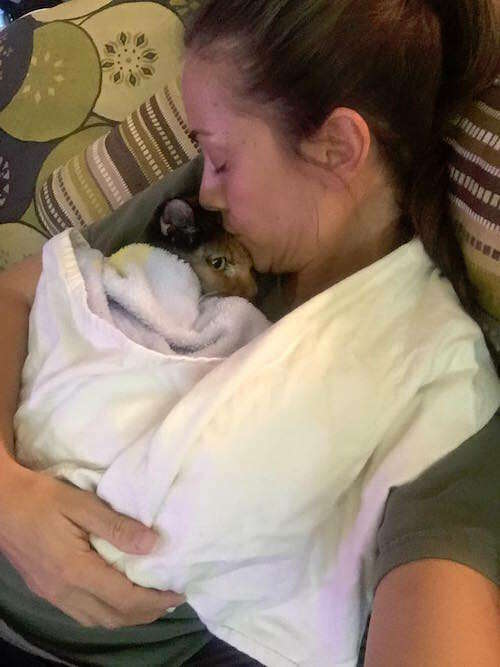 She was given a temporary home with her foster mom Brianne, who wanted to make her comfortable no matter how much time she had left. But by some miracle, the resilient cat surprised them all. Thanks to round-the-clock care and lots of TLC from Brianne, Ann’s frail body began to transform. 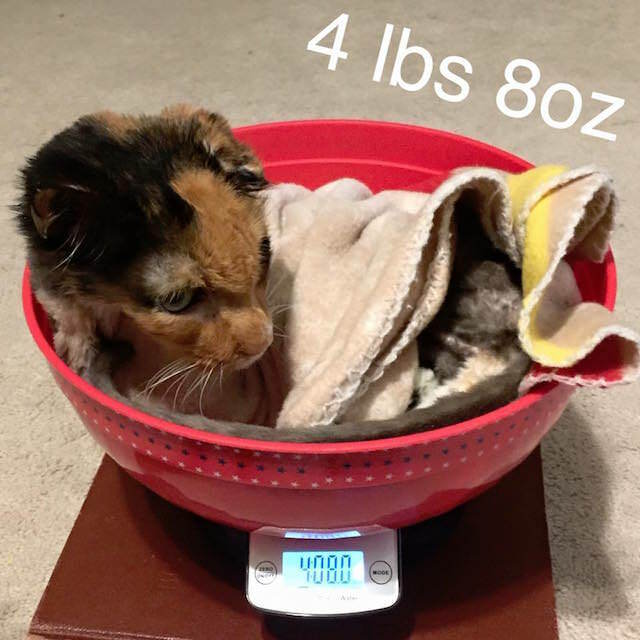 She gained weight (now she’s 10 pounds!) 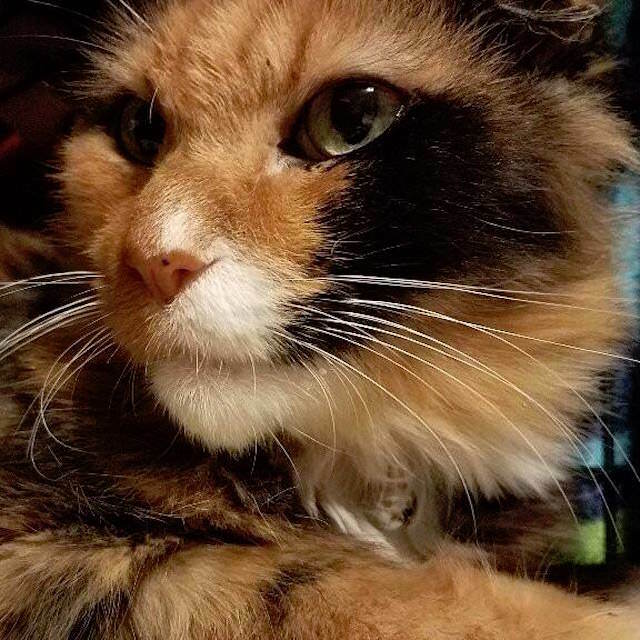 and her gorgeous calico coat grew in, long, soft, and glossy. 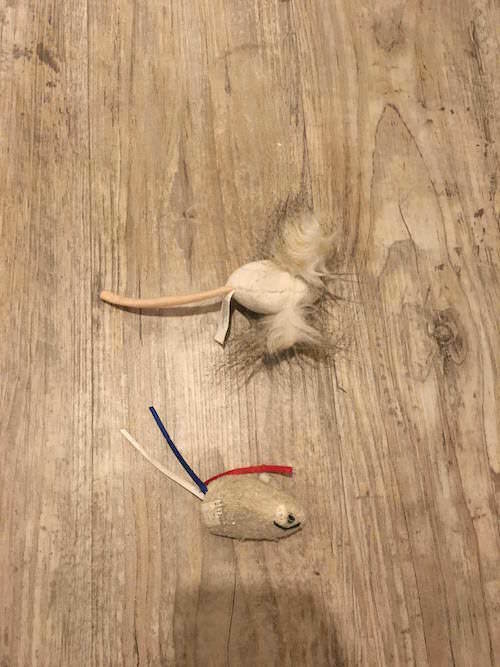 Despite having all the odds against her, the kitty pulled through and prospered. Brianne is in a military family, and they eventually moved to California. 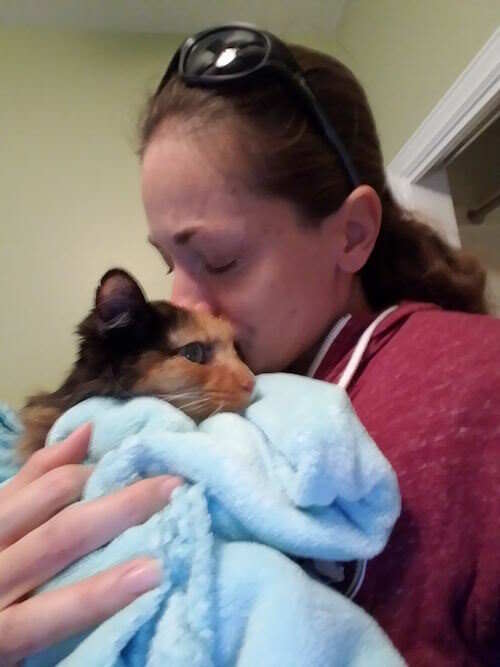 After a tearful good-bye, she passed the precious kitty on to her new foster mom, Megan. Thanks to Brianne’s love and dedication, Ann survived a horrific ordeal. And now thanks to Megan, she’s learning how to live in a loving, comfortable home, and her beautiful personality can really shine through! 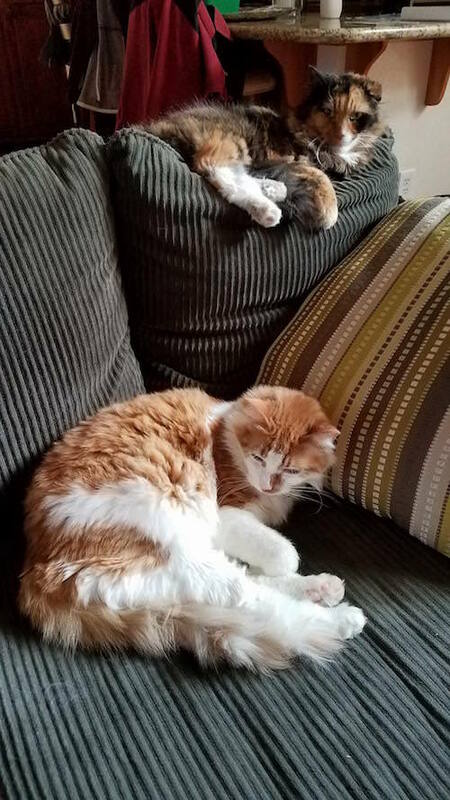 Despite moving away, Brianne keeps tabs on how her former foster is doing, and was able to give us an update. 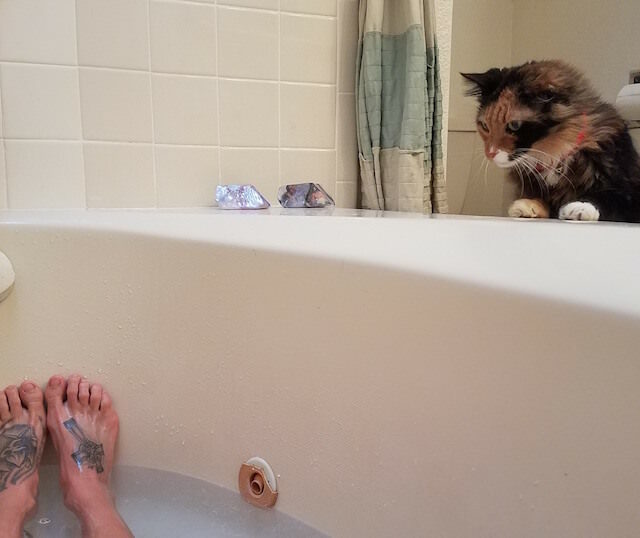 It is truly amazing how far this beautiful calico has come! Now, the only thing Raggedy Ann needs is the purrfect forever home! 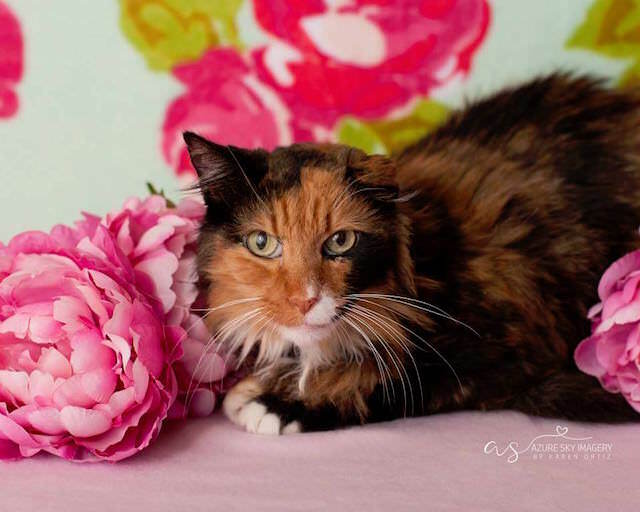 This senior girl would do best in a quiet household without dogs, but prospers in the company of feline friends. She does well with older children, as long as they are respectful of her. Are you interested in opening your heart and home to this amazing girl? Visit her adoption profile by clicking here. Share this story and together we can help Raggedy Ann find her forever family! 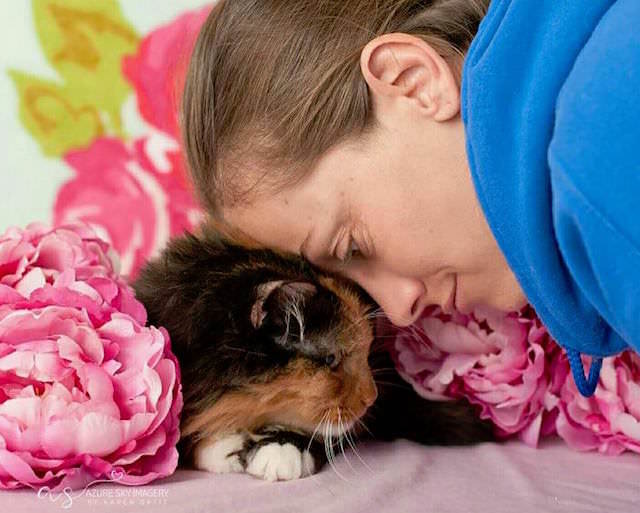 Thanks to Brianne for helping us share this brave kitty’s story!